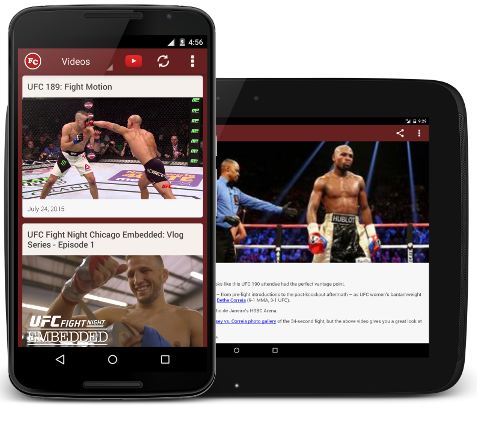 Simple and easy to use, FightCreed is the most solid and robust MMA and UFC mobile app available to fans using Android phones and tablets. FightCreed offers the most comprehensive Mixed Martial Arts (MMA) and UFC news coverage, events, results, videos, fighter profiles, stats, and much more from all around the online world, allowing you to receive all of the latest information instantly and immersing you in the world of ultimate fighting. Stay connected in real-time with your favorite fighters through our built in Twitter community, which gives you the opportunity to see what fighters are saying and respond to them directly, or engage in live discussions with other fans from around the MMA world. Watch streaming MMA videos based on topics that have been curated from trending MMA news articles and events using our proprietary process. Currently, FightCreed is a mobile app available for the Android platform. We will be releasing a version of FightCreed for iPhone, BlackBerry, and Windows Phone users in the near future! FightCreed currently has a rating value of 4.7 ( 19 ratings ) out of 5 stars on the Google Play store! FightCreed is currently FREE to download and use!